I love to bake! I have not been baking much this year due to different diet restrictions. Today I decided to bake with my 3 year old and these are the cookies he wanted to bake. We had a great time making them. It was great to go back to something I love to do and share my love of baking with my son. I found this recipe here. In a mixing bowl, beat the butter and sugar on medium speed until light and fluffy. Beat for about 3 minutes. Then add the eggs and vanilla and beat until combined. Put the mixer on low and slowly add the flour mixture and mix until a smooth dough forms. Cover the dough and refrigerate for at least one hour. Roll the dough out to 1/4 inch thick on lightly floured counter. Using a 2 1/2 inch round cutter to cut circles out of the dough. Then place the circles on baking sheet 1 inch apart. Remove and let cool completely on wire rack. Prepare the glaze: In a large bowl, whisk together powdered sugar, water and almond extract until smooth. Dip the cookies in the glaze face down, letting the excess drip off. 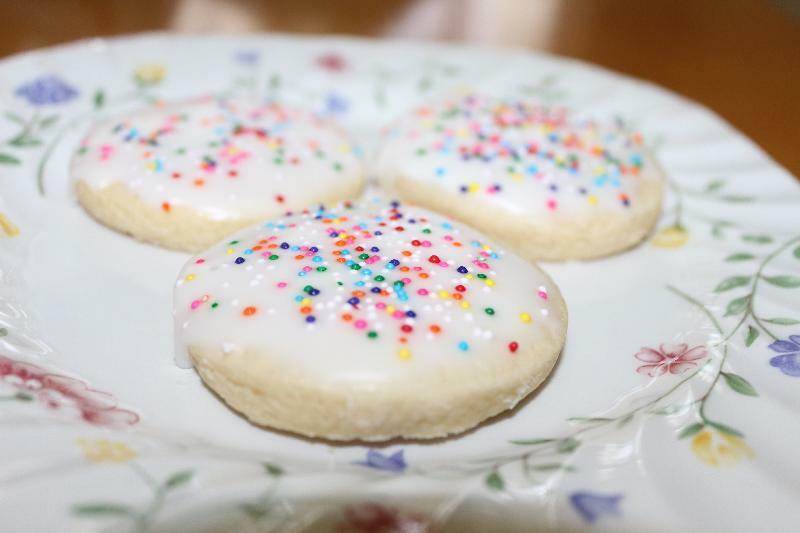 Place the cookie back on a wire rack set over wax paper and sprinkle liberally. Let set for about an hour before serving.